I received many cards in school saying: Be My Valentine! I just smiled, and had no clue what this was all about. Ginger was brought to Europe more than 700 years ago, when the Venetian explorer Marco Polo brought it back from the Far East at the end of the 13th century. 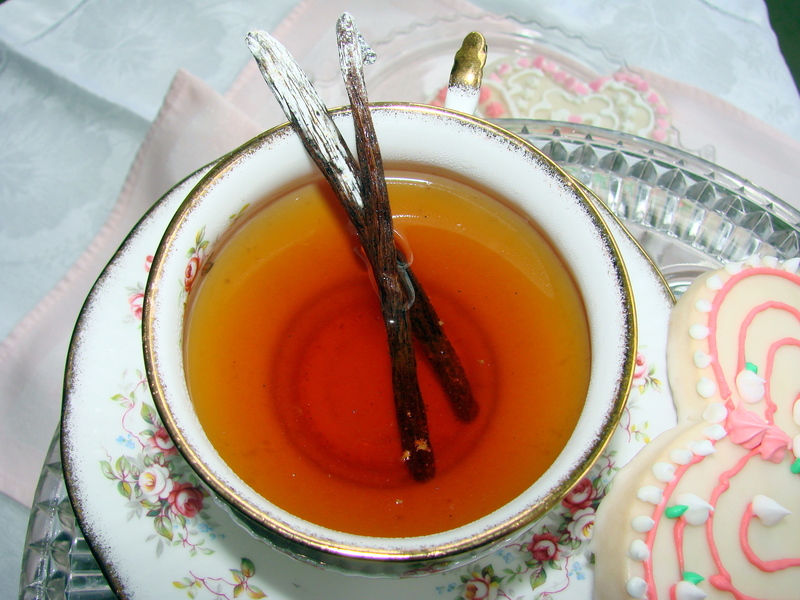 It was quickly discovered that when one added ginger to bread dough as a flavoring, it also preserved it from spoilage. Breads remained fresh longer and did not spoil with mold growing on them. With this new discovery baking became an artistic venture, especially after sugar was introduced by Italian merchants during the 16th century. 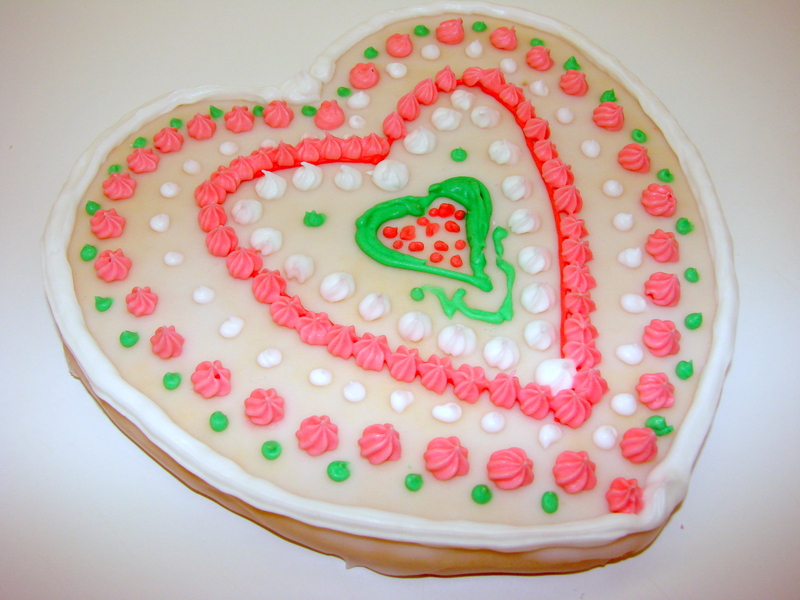 Legend tells us that during the Middle-Ages, fair ladies at the courts competed with baking ginger/honey spiced fancy hearts and decorated them lavishly. At the time of the tournament battles these hearts were given to the admired participants expressing the ladies favor and love to the knight she chose. As a child having lived in a village in Croatia, I remember being taken to the “Kirweih” a summer festival much like the County Fairs we have now, where the villagers cooked and baked for days before, to set out their specialties for the visitors to buy and taste. There were games, and rides and for me as a child a lot of confusion. But, I do remember seeing young couples walking hand in hand with the girl clutching a big cookie heart to her chest and having a big smile on her face. There were stalls with these hearts of every size, and decorated in all colors, expressing good luck, health, wealth and most importantly LOVE. Now the roles have changed, the young man gives the heart to the girl he loves and admires. 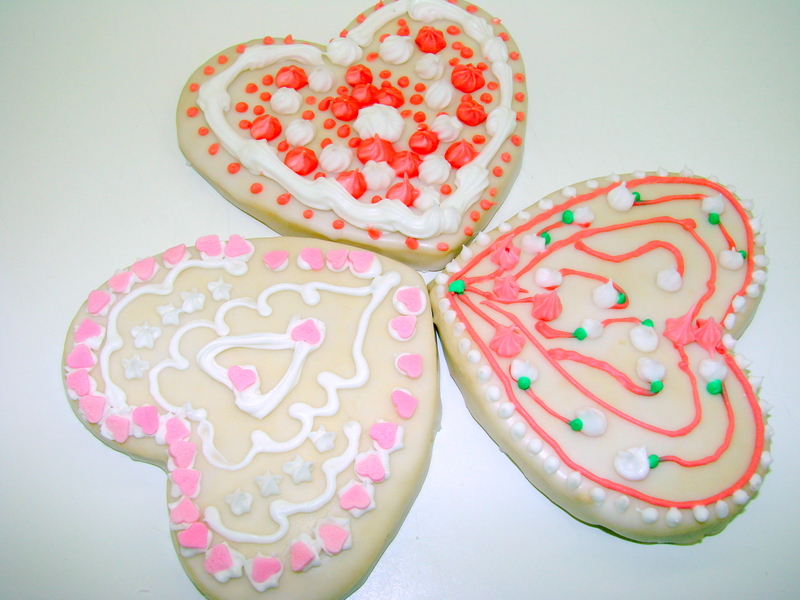 This is my first attempt to decorate cookies in this manner. I have actually made them for my two grandchildren and have mailed them off to arrive by Valentine’s Day. I did not make the cookies out of gingerbread dough, these are simple vanilla butter cookies that I rolled out to be about a quarter inch thick. After baking them and having given them time to cool, I glazed them with royal icing. I thinned the icing with a little water to make it spreadable using a medium size watercolor brush. I laid them on a rack to drip off and dry. While they were drying I transferred some of the icing into several small glass bowls and added food color to them…one drop at a time and mixed it so I could judge the intensity of the color. It is actually a lot like painting and creating your own colors for your picture. I learned that when working with the food colors I needed to use plastic gloves to protect my hands from becoming multicolored. It was fun to do and I will have to try again and again to become better at this kind of cookie making. 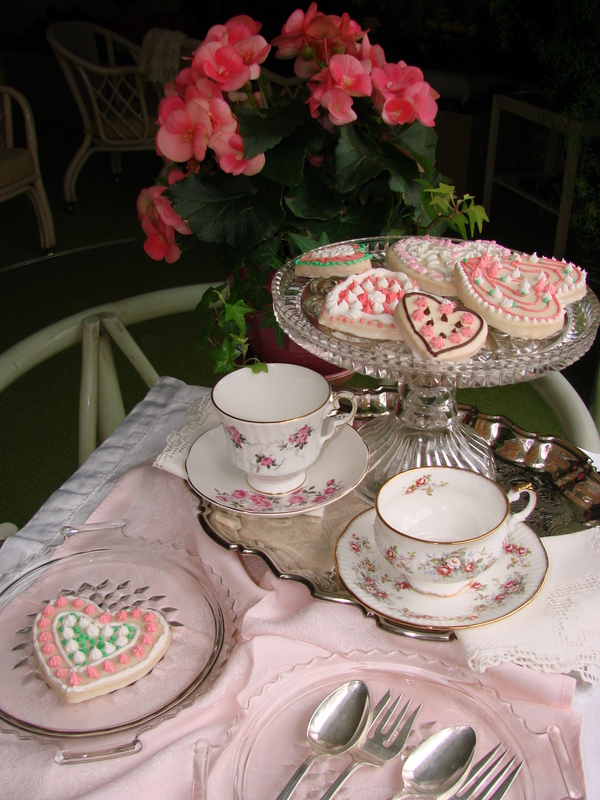 If you have not done this before I would urge you to find Julia Usher’s books on beautiful cookies. She is not only an expert, but is truly an artist. 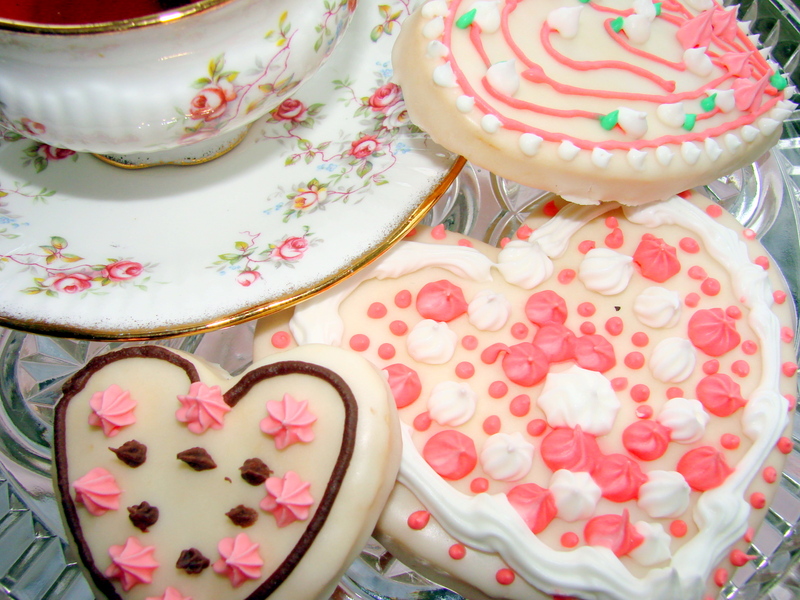 Her cookies are like jewels. She has several books on this kind of cookie decorating, my favorite being: “Cookie Swap” you can get it and all her other books on Amazon. For this recipe I used the food processor! Place the flour and baking powder into the processor, pulse a couple to times, then add the cold butter into the food processor and pulse a few times again to cut the butter into pea-size clumps. Add the sugar and again pulse a few times to mix the sugar into the flour and butter. Take a small bowl and add the egg the yolk, Vanilla Extract and brandy then whisk these three ingredients together until well mixed. Now add the egg mixture to the flour mixture in the processor, and pulse and run the processor until the mixture forms a dough. Take the dough out of the processor and wrap it in plastic wrap. Refrigerate the dough for about 20 to 30 minutes before rolling it out to be about 1/4 inch thick. I like to roll out small portions of the dough to make it easier to cut out the cookies. Bake the cookies on a parchment lined cookie sheet at 375 F, until very lightly browned, then cool them on a rack. This Vanilla Butter Dough can be used for many other pastries, it is a very versatile dough. Use an electric mixer, mix these two ingredients together and beat them until snow white and creamy…do not over-beat, if over beaten the icing will be dry and it will not work well for you. You can also buy the dry egg-white powder and follow directions for Royal Icing on the box. teaspoons and dessert forks, a couple of fancy napkins and a pretty cloth. a platter full of your decorated hearts, some fruit on the side…. and plenty of tea so you can be chatting for a while. with whom you spend an afternoon while giving of your time, and kind thoughtfulness. As always, your post contains a charming story, an informative read and beautiful photographs. I really will be trying your recipe for Vanilla Butter Cookies, as I have never quite settled on a “sugar-type, rolled” recipe that has worked well for me. When rolling your dough out, do you use a marble board, and, do you suggest a light sprinkling of granulated sugar to keep them from sticking? I look most forward to my notifications that you have updated your blog, and, the moment I see that page turn, the first thing I do when I sit down at my computer is check on what you are “up to” in Maja’s Kitchen!!! PS: Don’t tell me this is REALLY your fist attempt at decorating cooking in this manner??? You are soooooo dear to tell me that you read my stories as soon as they arrive to you…..I do the same with yours…I have to admit…and find your recipes very tempting…for right now we LOVE your scallops in browned butter which I have made with great success. About the butter dough…I have a plain 25 year old white Corean-like counter on which I do all my pastries…no marble, no granulated sugar is necessary to roll this dough out…maybe a little flour….if the dough is cool…it will not stick…and, yes – it is the truth that this is the first time that I glazed the cookies with the Royal Icing…and got it the right consistency to brush it on them with a simple thick watercolor brush….The next time I will make them I will flavor the icing with a few drops of lemon juice…I think this will give a little spark when one takes the first bite…..Hope you try to make these cookies soon, maybe for Easter…..? Thank you for your nice comment , Christine….! 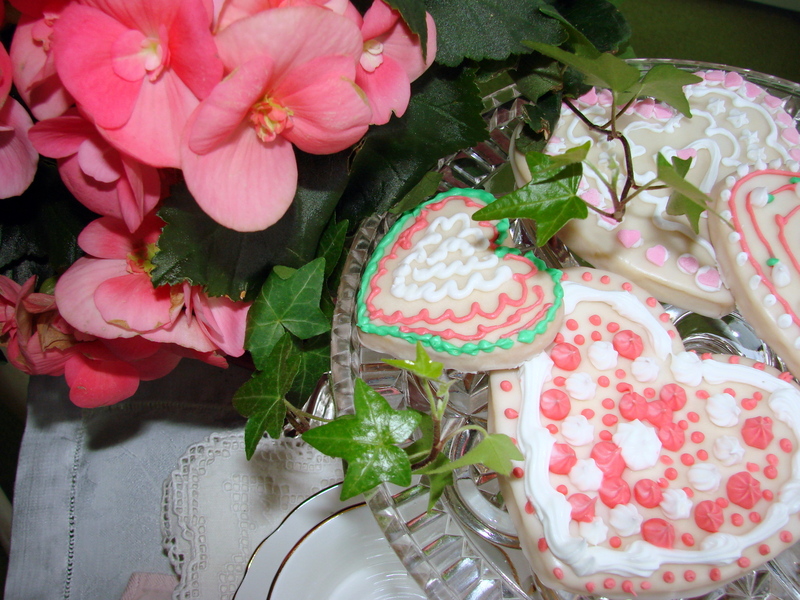 Beautiful photos, gorgeous cookies, and a very sweet heart. Thanks for the lovely Valentine to us all, Maja. 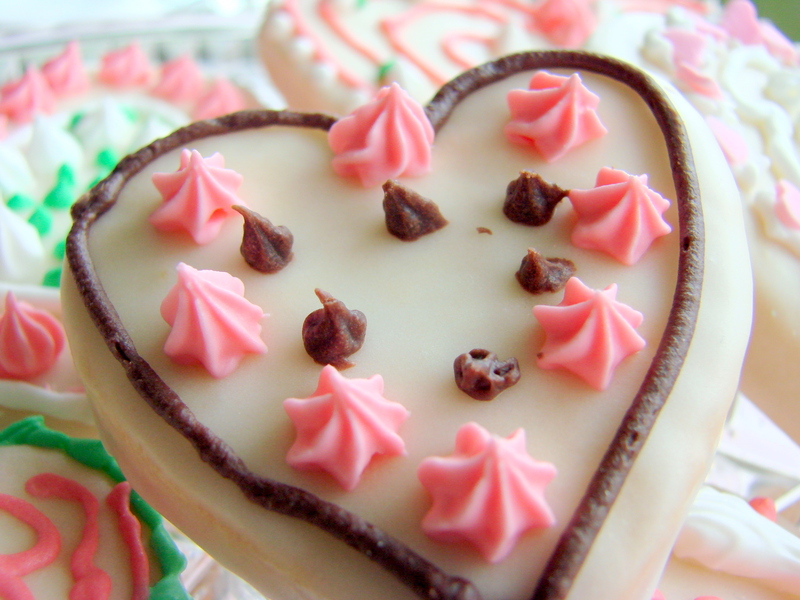 Very nice Valentine’s Day post–cookies are very pretty. And yes, Julia is an artist. I don’t remember whether Valentine’s Day was celebrated in Germany or Austria or not. Interesting that it was new to you. Have a nice day and a better one tomorrow!